The first hands-on reviews of production units of Canon 5D Mark II started to appear in the internet. DXO Mark database now includes results for Canon 5D Mark II. It’s interesting to see it in comparison with other models. It looks that the new 5D has capabilities very similar to 1Ds Mark III; and it’s nice so see that the noise of the new camera isn’t any worse comparing to both old 5D and to 1Ds Mark III. While my EOS 40D was in repair I have purchased Canon G9 camera. I had a few reasons for that – having some backup for my SLR, but also having a compact camera that is easier to carry with me in case I don’t have SLR; and also having a camera that other family members can easily use. 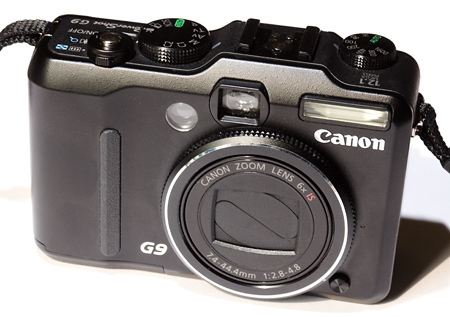 In case you don’t know, Canon G9 is not a usual compact camera. It has a number of features that make it interesting for serious use: good quality pictures, RAW format, full manual control, image stabilization, hot shoe for external flash. I haven’t used it intensively, neither I run a formal test – this is why I titled this post “first impression”. Some reviews of G9 that I have read position that camera similarly to range-finder in comparison with SLR (and by that they distinguish it from cheapy plastic full-auto ones). I must admit that it doesn’t really feel as a rangefinder. In fact it feels similarly to full-auto models. However controls and functionality do make different impression indeed. Although RAW files from G9 have the same CR2 extension as from Canon DSLR cameras, Canon Digital Photo Professional software doesn’t work with the files from G9. The only native Canon software that works with G9 RAW files is ‘RAW Image Task’ that is called via Zoom Browser EX. I use different workflow anyway, but just need to warn you: ‘RAW Image Task’ enforces some sharpening and some noise reduction even when you set corresponding parameters to 0. In case you use 3rd party RAW converter such as Adobe Camera RAW there is no problem (and you can clearly see the difference). I am not sure about the older versions of Adobe Camera RAW, but version 4.4 works with G9 RAW files without any issues. The optics is quite good – no visible vignetting and quite sharp picture with good resolution. Cityscape picture with tiny aerials shows good detail through the whole frame. In some situation barrel distortion is obvious, but it can be corrected in post-processing. Chromatic aberration / purple fringing is reasonable, and can be fixed in RAW converter or photoshop when it shows up. G9 image looks much noisier comparing with EOS 40D or even EOS 350D, and I don’t mean color noise. I mean the picture is less smooth, it resembles EOS picture when sharpening is applied. When you enrlage G9 picture to 400% or 500% you can see that color transition between pixels isn’t very smooth even on single-color surface. Depending on your requirements this effect might be not too important for you. It can be reduced in post-processing; and also down-scaling the picture to 6 megapixel can reduce the effect a lot. Microstock agencies that are extremely picky about the quality of pictures accepted my test shots (filtered and downsized to 6 MPx). Full manual control – you can set ISO, aperture and shutter speed. Histogram – can be seen after the shot is made, but also can be seen before releasing the shutter. That helps to evaluate the right exposure. Autofocus works quite well, although you can not select the exact point other than central one. Image stabilisation works well. A good portion of my 1/13th second pictures taken handheld appeared sharp afterwards (indeed shorter exposure means higher per cent of sharp pictures). Macro mode works well, but you can only take the lens very close to object in wide-angle mode. Still quite nice, not possible on DSLR without special macro lens. Battery life is quite long. Even when battery indicator flashes at low level, quite a few shots can still be made. There are no miracles – Canon G9 has quite obvious limitations and the quality of images is below DSLR. Still, G9 is very nice camera with good features capable of producing decent quality pictures.